That noise reduction is actually really impressive. The Canon 7D has pretty bad low light performance. Those lines you are seeing is fix patterned noise and is totally normal. personally I try to never shoot above 200iso. At 400iso I start getting hot pixels and the image noise gets really bad from then on. Thanks, I'm feel better now with 3rd party validation, reference. Thank you! It's just pretty heavy denoising with neat video. Well worth the money, to be honest. I paid for like the multiple keys for Premiere/ After Effects. Also, this is for @dfort - I am on firmware 2.0.6 now and I am running pretty stable, I have all the essential features I would like out of Magic Lantern to keep my camera worthy and usable for everything I do. Couple issues I have - when recording, some of the focus marks and overlays(?) tend to freeze on the screen & stay there which is very ugly and distracting while I film, but it doesn't burn into the actual video, which is good. Second, I was preparing to do full 14-bit raw, up to 12 minute long takes at 1600x900. The camera got that far. No problem. It was a huge file, which was expected. Whilst building the index files, it was too much for the camera I noticed. But even building OTHER index files for smaller shots, my camera glitched out and gave me an ugly purple/pink distortion. This lasted until I reboot the camera, of course. But for future instances, I don't want to have to rely on rebooting the camera in case I do.. say 5-6-7 minute or more longer takes and I hit the playback button. This would mean I would NEED to have MLV play module OFF which is an extra hassle/step. I don't mind it, but I don't prefer it, either. I also ran some tests when I upgraded to 2.0.6 and some passed, some didn't?, the camera just went into a nonstop test mode- it was for benchmarking, I believe. It was some time ago. You tell me what I need to do for you so you can work your magic. Wow, you're giving 2.0.6 quite a workout. when recording, some of the focus marks and overlays(?) tend to freeze on the screen & stay there which is very ugly and distracting while I film, but it doesn't burn into the actual video, which is good. Have you tried turning off Global Draw? That tends to clear up problems like this. You are running mlv_play? I haven't tested that but when you come up with issues like this try the 2.0.3 version and see if this is a new bug. I also ran some tests when I upgraded to 2.0.6 and some passed, some didn't? Of course it would help to be more specific but the previous comment on running the tests on 2.0.3 also apply. I believe that there are some tests that this camera can't complete. Also note that this is the one camera that doesn't play well in QEMU so there are no tests on the build server. I need this to make my camera magic. I'm stubborn, super experimental, and it's my only camera that makes me produce wonders for my work / business. I do photo/video and for photography, Canon takes the cake, everytime. I might switch to 5d mk iii in the near future for a full frame/low light upgrade, but it'll be some time because I've invested so much into this camera already. But using proper lighting and Neat Video saves my image almost every time, so I make do! PLUS THESE COLORS ARE TO DIE FOR. Film lives on forever! I use global draw for focus assist because I just can't seem the nail the focus anymore manually without it. I'm not sure if it's my lens or something, but even the auto focus doesn't nail it properly sometimes, either. I know it won't happen with Global Draw, I believe. I need to run some more tests. Right now I bought a dummy battery and am building a battery bank rig for my camera so I can have a very long battery life. I will update you all on how it goes, but so far it's working solid. Building it is the biggest problem. I am running MLV_play but I think it was just because it was about 6-9 index files it had to build at the time and it was just WAY too much for the processor to handle. Update on the 7d - 2.0.6. Still pretty stable. It seems every now and then I need to let the camera warm up with a failed clip if I'm shooting 16:9 at 1600x900 for consistent 23.976fps RAW 14 bit. I'll get the first 7 seconds to fail then the rest of the filming works just fine. I would still like the option to turn OFF focus pixels ONLY when filming and not JUST global draw because I normally shoot 2.20:1/2.35:1 ratio at max resolution available for 23.976ps. I still want to see the crop marks, audio levels, and framing & I would like to know what's in focus for me PRIOR to shooting and then NOT have the focus pixels show up when filming because when I process the footage. I don't want the pixels showing up and I don't want to have to worry about that. I just bought a dummy battery for the 7D and connected it to a portable 16750 mAh battery bank at 4.5A output for consistent power. It works, just not as good as having a battery INSIDE the camera. I took a photo whilst filming & in liveview for video mode and the camera actually turns off, glitches out, the mirror lock up gets stuck as if it's trying to flip up, but it's not, so it's like a stuck motor. Very scary moment because it feels like the camera is about to just flat out break, but it didn't. It's similar to an elevator door trying to close but there's something in the path of the doors but it won't close and it'll make multiple attempts to do so. I might go back to 2.0.3 for other tests and to see how well it works with a battery bank. We'll see! @dfort - Hey, I have an update for today. I powered my camera after the long night of shooting with the external battery, I reconnected a regular battery because I was shooting on a glidecam. I had my camera crash many a times & almost give me a heart attack because I was shooting an entire car show today. I had left the Canon displays on before I inserted the card the night before, then inserted the card and switch to Magic Lantern overlay & this happened. I also couldn't take a photo at one point & review. 3 different incidents. Built on 2018-07-04 21:36:26 UTC by rosiefort@RosieFoComputer. What do you gather from this? Let me know if you need to try to recreate anything. So it was working fine when you were messing around with the camera and when you had something important to shoot it borked? Yeah, that sounds about right. Seems like it is having issues getting through the startup tasks. Try resetting the settings. Either through the ML menu or delete the ML/SETTINGS directory from the card. You'll have to redo your settings but that usually clears up problems like this. Since the issue came up when switching from external to internal batteries, try a battery pull. Doing a battery pull is needed after a hard crash where the camera won't turn back on but sometimes there are more subtle issues that can sometimes be resolved with a battery pull. Then again it could be none of the above. Check to see if the camera works fine without loading ML. Maybe reset the Canon settings if the problems persist. Hey dfort - yes I did all the above. I had to do MANY battery pulls. That's also true when experimenting around with 2.0.3. So is 2.0.6 stable now? The break was on 2.0.6 but honestly, it's 8/10 stable. I'm using it for the daily now and I just went back to 2.0.3 for 10-12 bit raw tests but I don't like needing to 5x zoom and all to record raw, let alone for slo-mo and all. So I stick to low res 14 bit because it's high quality ANYWAYS. I give 2.0.6 a green light but only for 14 bit RAW and every other reason to use ML. But reliability is more important to me than anything! That's another experiment that has issues. What I'm interested in is you could compare apples to apples -- the nightly 7D.203 vs. the nightly 7D.206. Any differences you found? Note that my 2.0.6 port has a few pieces that I wasn't able to update, mainly due to not having access to the master processor. For the most part, which I'd have to do more extensive testing & casual shoots to see what the camera performs like - was the responsiveness. The 2.0.3 build seemed very smooth & responsive, almost little to no lag WHERE EVER I was flipping through the menus. 2.0.6 seems to slow down at times, lag a bit, freeze for a moment or so then catch up, not to mention the earlier issue I mentioned about global draw specs getting kind of stuck on the screen when filming and changing up a bit every now and then. Let me recreate that issue tonight & upload what I mean. I never had that before in 2.0.3 that I ever remember. I think with more love, 2.0.6 would be perfect and just as stable. I just invited a friend who was paid 6 figures by the school because of his expertise in coding to join the Magic Lantern development train and help us develop this further. I wanted him to spend his time with me somehow since he endured a terrible accident a year ago and kind of does nothing now. I need to catch him up to speed on what to do for this. New tests & experimentation lead me to new issues on the 2.0.6. NOT a game changer, just things to note. But basically 720p 60fps with FPS OVERRIDE kinda just messes up the image & everything when shooting RAW 14 bit. All settings and information is here. May I ask 7D users trying to reproduce a bug? AF lens required and about 3 minutes. Tripod optional but helpful. Make sure to have ONE SHOT set in Canon menu. Make sure to have AF selected on lens. Point cam to something it can focus. Now cover lens with something opaque (lens cap or cardboard) and give cam some time to find out it cannot focus. What my cam (7D.206 with EF-S 10-18 STM) does: After focus is found ... shoot like crazy! Have to turn it off! Please test and report. I'm unable to test 2.0.3 right now. Other users with Digic IV cams are invited to test it, too. Interesting test. I'll check it out with 2.0.3 and 2.0.6 when I get 3 minutes -- uh, maybe it will take 6 minutes? Just like in your description. So this camera does not work well either. I suppose all D4 cams act the same way. Did the test on the 7D in both 2.0.3 and 2.0.6 and could not reproduce the issue. This isn't a feature that I'm familiar with but it seems to me that it doesn't work properly. Sometimes a change in exposure would trigger it, sometimes not. I couldn't reproduce the shoots like crazy issue. Maybe the lens has something to do with it? I used an old Canon EF 28-105mm f/3.5-4.5 USM lens and a new Canon EF-S 18-135mm f/3.5-5.6 IS lens (that's the one the 2.0.6 firmware "fixes") with the same results. Maybe try resetting to Canon factory default settings and try it again? Sometimes that makes a difference. Which 18-135? Nano-USM or STM? After lens covered you have to give the cam time enough to give up on focus. If it won't start focus (which may happen) when darkened bug will not occur. Just repeated the test with EF 100/2.8 Macro USM (without L) and 7D. After 2 or 3 retries it went crazy. It's not the lens, no. 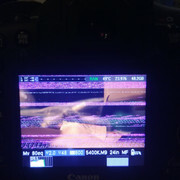 And 650D is affected by the bug, too. After loosing AF once it simply won't trigger focus motor anymore. I use Canon 18-55mm STM. The Nano-USM. Though it looks like the lens doesn't make a difference. Ok--good to know. So it probably affects other cameras and it isn't always triggered so we have to keep trying to reproduce the bug. I tested with my 7D and a 55-250 IS STM and the shutter went crazy just as you experienced. 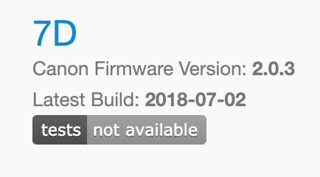 Using 2.03 July 3, 2018. Thanks for jumping in and verifying this bug! Having some issues shooting stills using 2.0.6 and dforts build. Camera freezes on the preview after shooting an image. Have to open the batt door and pop battery out to get the camera to shut down. Document steps to reproduce the issue and create an issue report. Create a bug report here https://bitbucket.org/hudson/magic-lantern/issues?status=new&status=open instead. After checking if it is a new and not reported earlier.